The House Republican tax bill has finally been revealed. Reduces income tax brackets: There are seven federal income tax brackets in today's code that are taxed at 10%, 15%, 25%, 28%, 33%, 35% and 39.6%. Nearly doubles the standard deduction: The bill raises today's standard deduction for singles to $12,000 from $6,350 currently; and it raises it for married couples filing jointly to $24,000 from $12,700. Eliminates personal exemptions: Today you're allowed to claim a $4,050 personal exemption for yourself, your spouse and each of your dependents. The House bill eliminates that option. Expands child tax credit: The bill would increase the child tax credit to $1,600, up from $1,000, for any child under 17. But that $600 increase won't be available to the lowest-income families if they don't end up owing federal income taxes. That's because unlike the first $1,000, the extra $600 won't be refundable. Refundable means that if your federal income tax bill is zero, you get a check from the government because of the credit. The bill would let more people claim the child tax credit. The income level where the credit starts to be phased out would increase to $115,000 for single parents, up from $75,000 today, and to $230,000 for married parents, up from $110,000. Creates two new family credits: The bill would create two different $300 tax credits, but they would be in effect only for five years and would not be refundable. The first would be for nonchild dependents -- for instance, any son or daughter over 17 whom you're supporting, an ailing elderly mother or an adult child with a disability. The second is a credit for each spouse if they file jointly (or, in the case of single parents, the head of household). 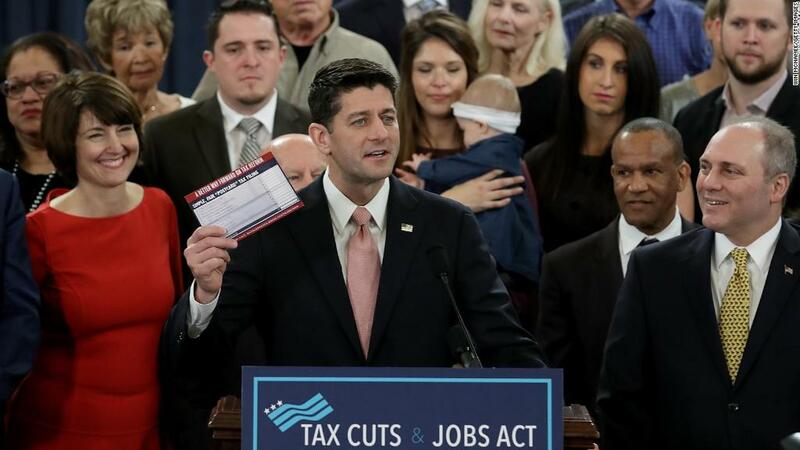 So a family of four -- two parents, a 12-year-old daughter and an 18-year-old son -- could reduce their tax bill by $2,500, said Elaine Maag, a senior research associate at the Urban Institute. They would claim the $1,600 child tax credit for the daughter, the $300 nonchild dependent credit for the son and a $300 credit for each parent. The income thresholds governing these two new credits are the same as for the child tax credit. Eliminates tax exclusion for dependent care assistance accounts: Today some employers provide parents the opportunity to save up to $5,000 of their income in a dependent care flexible spending account. That money is excluded from the parent's taxable income. The House bill would repeal that exclusion. The dependent care FSAs are disproportionately used by higher-income families, Maag said. Repeals state and local tax deductions, but preserves property tax break: The original GOP proposal was to fully repeal the state and local tax deduction, which lets filers deduct their property taxes as well as their state and local income or sales taxes. But it was met with strong opposition from lawmakers in high-tax states and cities. So Brady made a concession. The House bill restores an itemized property tax deduction for property taxes up to $10,000. Limits deductible mortgage interest: The bill preserves the mortgage deduction as currently structured for existing mortgages. But it curbs it for mortgages on newly purchased homes going forward. You would only be able to claim a deduction for interest you pay on mortgage debt up to $500,000, down from $1 million today. The percent of filers who claim the mortgage interest deduction would fall to 4% from 21% currently because the standard deduction would nearly double, according to Tax Policy Center estimates. Leaves 401(k)s alone: After strong pushback from President Trump, among others, the House bill did not propose lowering the cap on pre-tax contributions from $18,000 today. Repeals the Alternative Minimum Tax: The AMT, originally intended to ensure the richest tax filers pay at least some tax by disallowing many tax breaks, most typically hits filers making between $200,000 and $1 million today. Those who make more than that usually find they owe more tax under the regular income tax code, so end up having to pay that tab instead. Tax experts often note the AMT no longer meets its original purpose and further complicates an already complex tax code. But it's been kept on the books because it raises a lot of revenue. Repealing it would reduce revenue by $440 billion in the first decade, according to Tax Policy Center estimates. Repeals the estate tax: The estate tax today affects just 0.2% of all estates, and only those with more than $5.5 million in assets (or $11 million if you leave a spouse behind). Nevertheless, Republicans are still pushing to repeal it. The House bill, however, has delayed the repeal until 2024, and in the meantime doubles the exemption levels. Given that the White House and Republicans have been pushing tax reform as a boon to the middle class and given that the estate tax exemption levels are high enough to protect the vast majority of family farms and businesses from having to pay it, this provision may face a steep climb to the finish line. CNN's Ashley Killough, Deirdre Walsh and Phil Mattingly contributed to this report.